Invasive species are a big threat to our North American ecosystem. Most invasive species have been brought from Asia as ornamental specimens. They not only do nothing for our ‘living landscape’, but they also take over and drown out our native species. These specimens could just be considered statues, because they aren’t contributing to our native insects or ecosystem. They are only sequestering carbon, maybe providing some habitat which is good, but we could do much better. It is a shame, but some of these trees are still being sold in nurseries. All the while a lot of money is being spent to eradicate them. Here are a few common species that we see here in our Kentucky landscape. All of these have native alternatives which are going to last much longer and be even prettier! It might be likely you have one in your yard, or your neighbor does. My dad planted 3 of these in what is now my yard many years ago. Many people in my neighborhood have them too. They were pretty popular in nurseries for purchase. There are several reasons why you see them often in the landscape. Nurseries carried (and they still do…) them because they were cheap to buy and produce. Any type of tree or shrub that’s really easy to propagate is likely not worthy having. They bloom white in the spring and have fall color too. They do, but there are so many better ways to add spring and fall color! They’re invasive. Yup. It’s true. I had all 1 cut down three years ago and the other 2 cut down two years ago and I still have issues of them sprouting back. One of them still sends shoots up all through the yard, and it was even treated. If you live in Lexington, take a look down Man O’ War next spring. 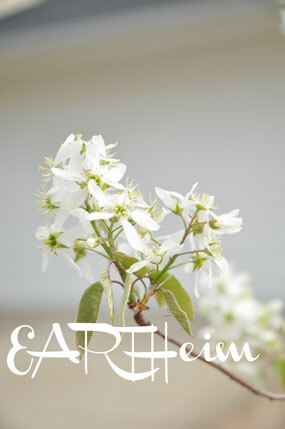 You will see the ‘wild’ parts of the roadway blooming white, because this naughty pear tree is taking over. They’re in parks that are left wild, it’s in fields that are left uncut. They’re everywhere. There’s even one growing in a crack in my mom’s back patio, and I couldn’t tell you where it came from. Not only do they sprout from its ornamental fruit, but it also sprouts from roots. They break easily. All pears have a type of structural habit that makes it prone to easily breaking. Its branching habit forms tight V shapes that puts certain pressure on the limbs, making them weak. They’re also weak because of their fast growth, which means weak and watery wood. Because of this breakage, they end up looking pretty bad over years of damage. These are short lived trees and eventually they will have to be cut down, costing you money! They are banned in Lexington as street trees now. especially to speed production. I have seen ornamental plum trees grafted to pear trees out in the landscape. At the base of the plum tree were ornamental pear tree sprouts. If a homeowner doesn’t catch this, it is bad news. 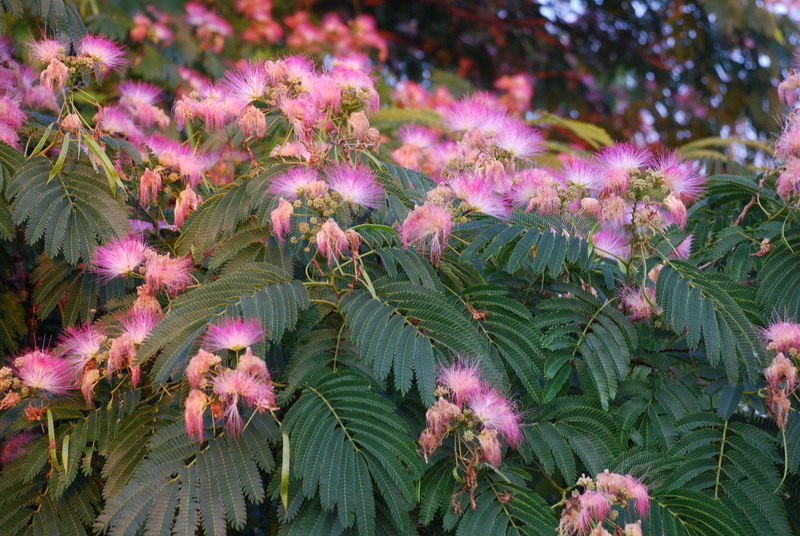 I first came to know Mimosa and its invasiveness as a kid. The people behind where we lived had one, and we were always combating their sprouting seedlings all over our yard. They would even grow in cracks in concrete, and we would find them even in the front yard. My mom still battles this mimosa tree. Different looking and a pretty flower yes, but they’re not worth the hundreds of sprouts that sprout up in everyone else’s yard. They also produce lots of seed pods that are messy and make the tree unattractive in the fall. Mimosas are also weak wooded and prone to diseases. Tree of Heaven should really be called the opposite of ‘heaven’ if you can imagine. It is no nice angel, the Tree of Heaven’s roots are very strong, and very destructive. It’s a deciduous tree with compound leaves and pale gray very smooth bark. Its roots can cause very serious damage to foundations, sewer systems, pavement, and anything else underground. 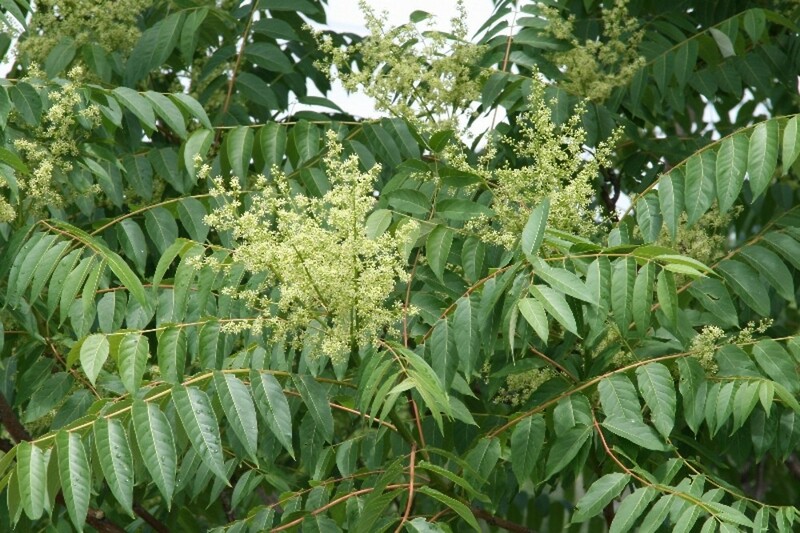 It’s a prolific seed producer and can survive extreme conditions, making it one tough tree. It resembles our native Black Walnut. You can tell a difference because it doesn’t produce the walnut, doesn’t have the smell of the black walnut leaf (it actually stinks), it has different bark, and a reddish stem along its leaves. If you find any seedlings in your yard, it’s worthwhile to remove them. Even as small trees, they are hard to remove. It’s also a worthwhile investment to have any larger trees removed and treated, especially if they’re near foundations, pavement, etc. They become very large trees very quickly. 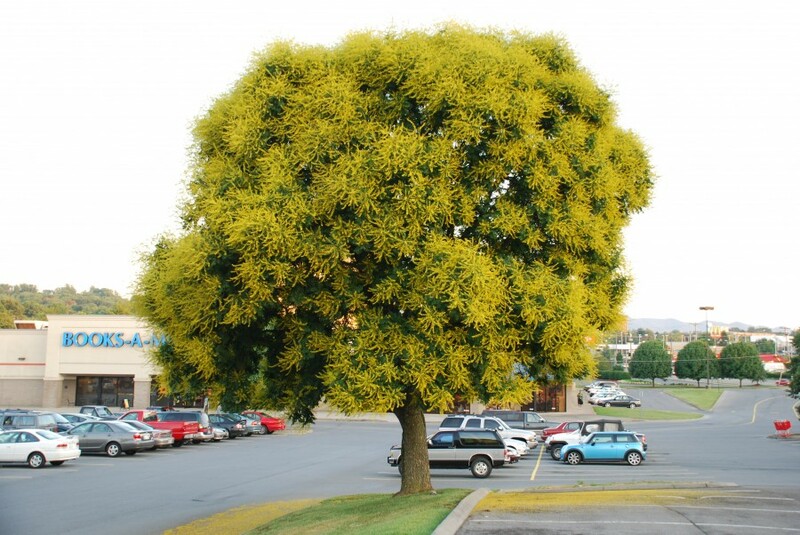 People enjoy the Golden raintree because of its yellow flowers and that is stays a small tree. Unless you want a lot of them, I would avoid planting this tree. It also seeds profusely, and another one that will grow anywhere including cracks in concrete. My neighbor has one by the property’s fence line and I have to make sure I watch for seedlings. After it blooms, it becomes covered in the seedpods, which I think makes it look like a messy tree. My grandmother also has one, and I had to remove lots of seedlings that had been growing up a few years from around her gazebo. All the seedlings looked quite messy and they were hard to remove. 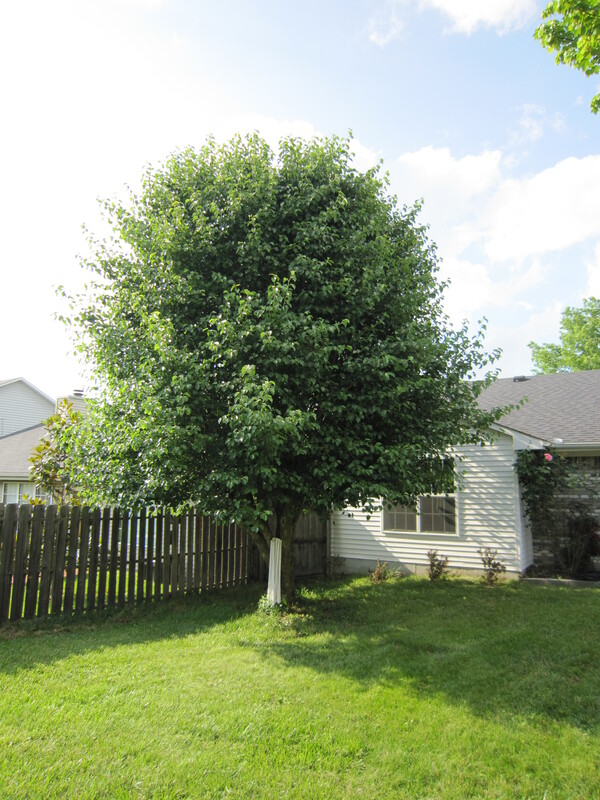 Invasive & exotic White Mulberry (we do have a native mulberry), Norway Maple. Also ask yourself if you think it would be wiser to plant a native tree vs. an exotic. A native tree is going to do a lot more for our ecosystem than an exotic one. Our ecosystem simply has not adapted to these exotic species and doesn’t know what they are. Any variety of our native oak is one of the best trees to plant along with willows and black cherry. Native trees will attract more pollinators and birds to our landscape.